The Appenzell Mountain Dog is also known as the Appenzeller Sennenhund and the Appenzell Cattle Dog. There are two separate theories concerning the origin of the breed. One theory suggests it is a native breed dating back to the Bronze Age. The other theory states that the Appenzell Mountain Dog was brought into Switzerland by the Romans. Regardless of which theory is correct, the Appenzell Mountain Dog is one of the four Swiss Sennenhunds. The Appenzell Mountain Dog is a medium size dog whose height will range from 18-23 inches and who will weigh between 49-70 pounds. The Appenzell Mountain Dog has a straight-haired double coat. The basic colors are black or brown with symmetrical white and rust markings. A white blaze and rust marking over the eyes must be present on the head. Rust is always between the black and the white. The Appenzell Mountain Dog is a very loyal dog. It tends to bond with one person but will be loyal to the entire family if they around it frequently. They are a very intelligent breed who need lots of attention. If they are ignored they may become mischievous and may no longer want attention from anyone. The Appenzell Mountain Dog is a working dog and loves to herd cattle and will eagerly do pretty much any other kind of work you want it to do. The Appenzell Mountain Dog is a very loyal dog. It tends to bond with one person but will be loyal to the entire family if they around it frequently. They are a very intelligent breed who need lots of attention. If they are ignored they may become mischievous and may no longer want attention from anyone. The Appenzell Mountain Dog is a working dog and loves to herd cattle and will eagerly do pretty much any other kind of work you want it to do. Although very loyal to it's family, the Appenzell Mountain Dog is unsure and weary of strangers. They do get along well with children and dogs and cats as long as socialized well as a puppy. You can find Appenzell Mountain Dog puppies priced from $1200 USD to $1200 USD with one of our credible breeders. Browse through our breeder's listings and find your perfect puppy at the perfect price. Although very loyal to it's family, the Appenzell Mountain Dog is unsure and weary of strangers. They do get along well with children and dogs and cats as long as socialized well as a puppy. The Appenzell Mountain Dog is fairly easy to groom. Just remove the dead hairs with a brush as needed. Appenzell Mountain Dogs learn very quickly. Because of their high intelligence, they really want to have a job to do. They enjoy being outdoor with their handler. The Appenzell Mountain Dog enjoys agility skill trials and games of catch. They enjoy having a job to do and enjoy the freedom of space. This breed is not appropriate for apartment life, living indoors or in a kennel. Appenzell Mountain Dog Puppies for Sale - Shipped Worldwide! Finding the right Appenzell Mountain Dog puppy can be dog gone hard work. PuppyFind® provides a convenient and efficient means of selecting and purchasing the perfect Appenzell Mountain Dog puppy (or Appenzell Mountain Dog puppies) from the comfort of your home, 24 hours a day, 7 days a week. Take advantage of our PuppySearch or leisurely browse our directory of hundreds of dog breeds, Appenzell Mountain Dog dog breeders, Appenzell Mountain Dog dogs for adoption, and Appenzell Mountain Dog puppy for sale listings with photos and detailed descriptions. Some Appenzell Mountain Dog puppies for sale may be shipped Worldwide and include crate and veterinarian checkup. 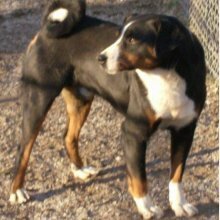 Many Appenzell Mountain Dog dog breeders with puppies for sale also offer a health guarantee. With thousands of Appenzell Mountain Dog puppies for sale and hundreds of Appenzell Mountain Dog dog breeders, you're sure to find the perfect Appenzell Mountain Dog puppy.